I discovered the existence of Red Basil a while back as I was driving towards another restaurant (surprise surprise!) and made a mental note to check it out the next time I was around. When I eventually did, I didn't happen to "be around", but deliberately drove a good distance for this. If I were this dedicated to everything I did, I would be a much better person. I had finished work, an activity I always find to be extremely hungrifying. Gleaning over the large menu and feeling particularly ravenous, my eyes lit up over everything they saw - the prices in particular. Was it true to get a decent feed of Pad Thai at dinner time, at a seemingly authentic Thai restaurant, at a mere NINE DOLLARS FIFTY? Bargain! A steal! Value for money! And perhaps...slightly suspicious. I wasn't sure what I would get. Immediately I had a feeling this could go both ways - I would either fall head over heels in love with this place, or it'd have me running, avoiding it like the plague. I always believe the best way to test the waters at a new establishment is to try out the classic dishes that have been done to death, to get a feel of how it plays out. 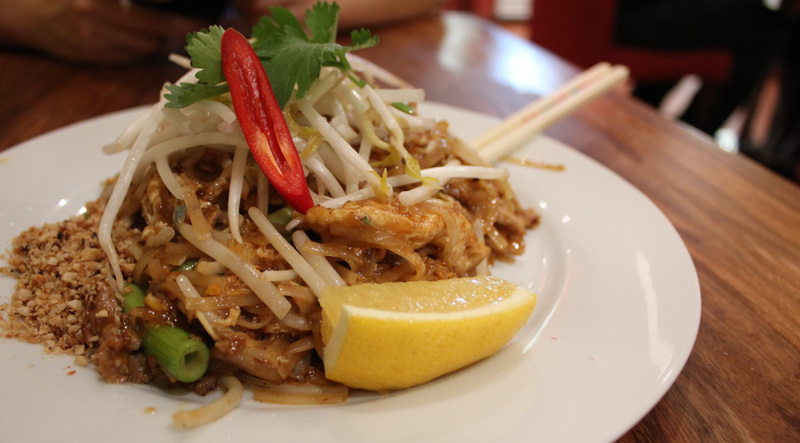 The go-to dish of Thai cuisine? Duh, you say. The Pad Thai was on the small side, but suffices with that sort of price tag! I myself found this dish satisfactory and enjoyed all its components because I don't exactly think when I am hungry, but I imagine some may consider the rice noodles to be a little sloppy. 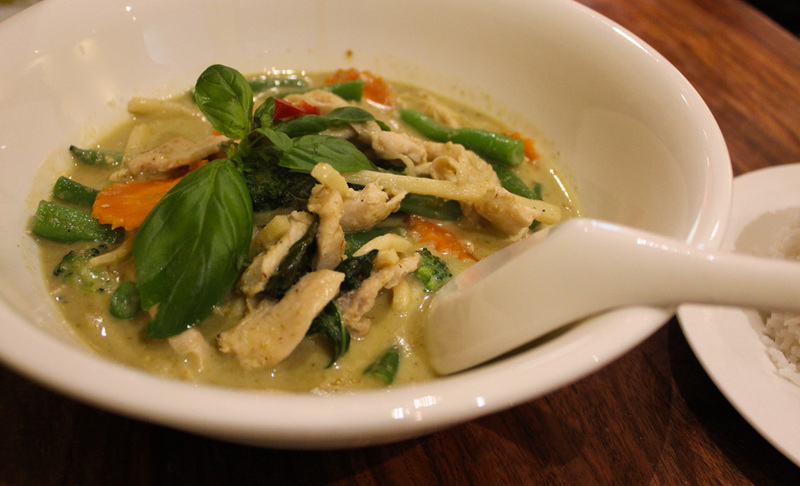 Green curry is an absolute favourite of mine, and seeing it on the menu usually renders all other dishes obsolete to me. Although I had already chosen Pad Thai, I am a bit controlling and force Andy to choose this as his dinner :) I can't help it. 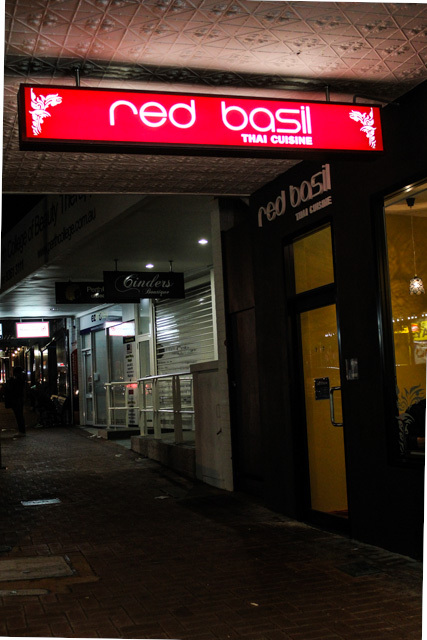 Red Basil's version spoils you for choice - vegetables and tofu; chicken, beef or pork; fish and seafood or prawn. 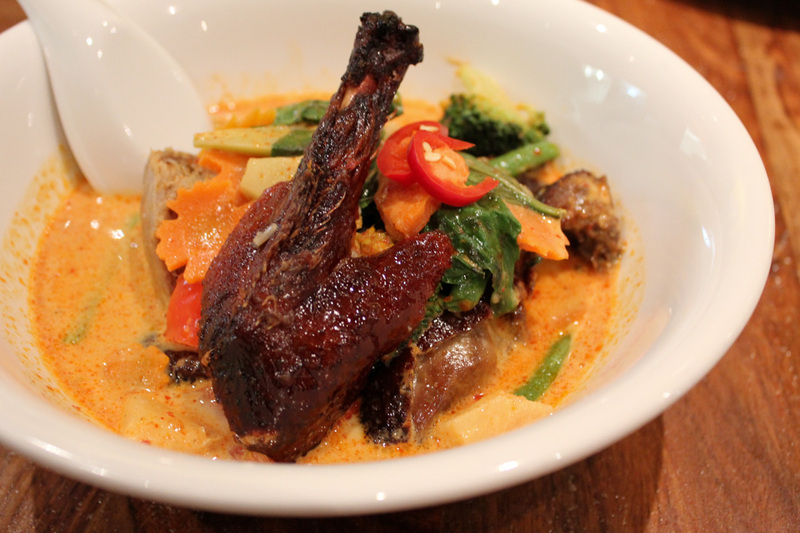 We choose the chicken and when it arrives, the coconut milk aroma is delicious. Although the bowl seems small, it is absolutely loaded with carrots, beans, brocolli, bamboo shoots, kaffir leaves and basil. I'm excited by its generosity, but the level is spiciness is cranked up high and warrants about a litre of water to be drunk with the meal. As Andy is busy fanning his tongue and making hissing noises on his side of the table, I'm starting to feel beads of sweat grow on my own forehead. Definitely a burner, even without the addition of fresh chilli in the curry. The next time I'm here is a few months after, and the restaurant is absolutely packed and buzzing. We don't manage to snag a table as there is already a line waiting, so they offered to give us a call when a table became free, which was a nice touch. The crowds do not settle even after a while. By this time, the girls are ready to eat and order 2 starters to start(?) us off, but end up becoming part of our main meals. 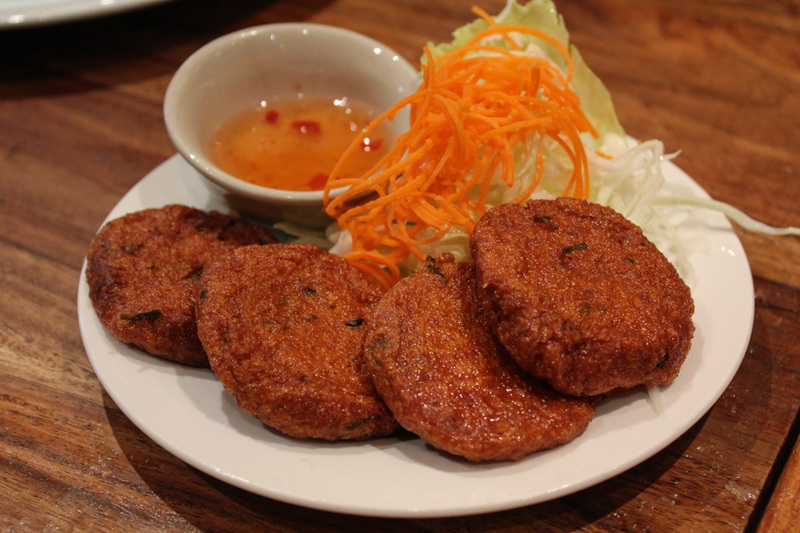 Melissa is a fan of fish cakes and enjoyed these patties made from a mixture of fish mince, curry paste and herbs. The side salad of plain shredded cabbage and carrot tendrils are unimpressive, but the cakes are a good start to the meal. The Peanut Sauce Chicken stir fry is somewhat a different dish to what I would usually order, but was a decent feed nonetheless. 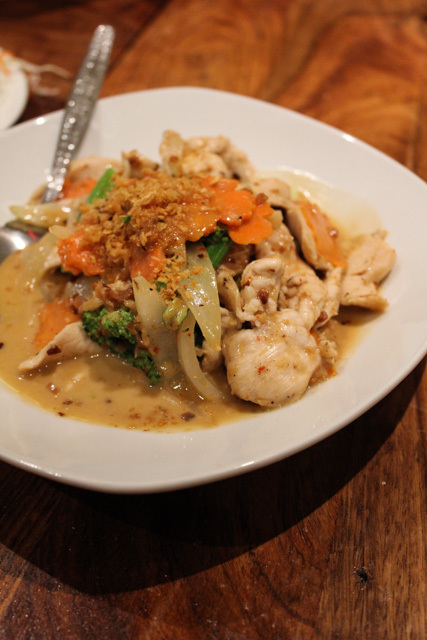 The chicken is a medley of carrots, broccoli, onions and kai-lan vegetables in a slightly sweet and watery peanut sauce. The sauce is thin and whilst I wouldn't call it bland, it could definitely pack more flavour. The table had a hankering for soft shell crab, which was quite a large serving for an entree. 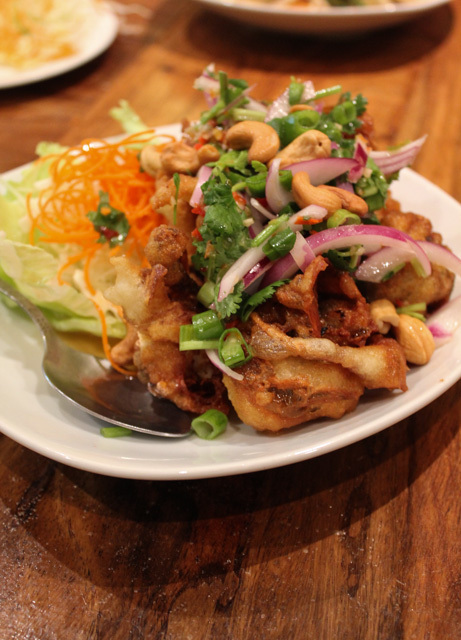 The deep fried portions are tossed through with onion, chilli, coriander, spring onions and cashews and were unfortunately lots of batter. It took a while to finish off this one. I remember it was a unanimous vote for the Red Duck Curry, as I had imagined the rich curry sauce would be amazing spooned over hot steamed rice. I liked the addition of pineapple in the curry, which had soaked in the curry coconut milk along with tomatoes, carrots, broccoli, beans and kaffir leaves. The star of the show - the roasted duck, was sadly not the star of the show. Although the skin gleamed with caramelisation and looked as promising as ever, the duck was not very meaty and was a bit tough to eat. A longer time to cook it probably would have made all the difference. Red Basil is a mixed bag of good and bad, but is unfortunately let down by its service on both occasions that I have visited. Friendly but unattentive, or forgetful - the litre of water that was needed with the Green Curry only came after 2 or 3 requests. The inefficiency is only emphasised more when you're waiting on some water to extinguish the heat! Whilst the food is not fantastic, it is certainly not bad either. The portions are fair and representative of the prices charged, and I was very surprised to only fork out a blue note and a few gold coins to pay for dinner that night. A happy (but not necessarily full) little diner! Times are subject to change - I was looking for a late lunch at 4:30pm and arrived to see the staff taking an afternoon nap on the chairs in the dining area. Sounds promising, I'll be sure to check it out. Thanks! I think this place is packed just because of cheap dollars that call people in. The food is actually so small portion, not good quality and importantly too much MSG. 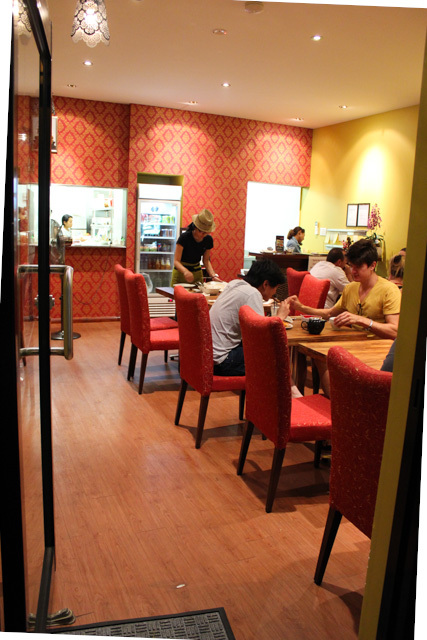 If you have try other Thai food around that area, Red Basil won't be in a competition!